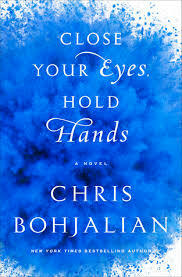 a book chick: "Close Your Eyes, Hold Hands"
"Close Your Eyes, Hold Hands"
The protagonist is a teenage girl whose parents both worked at a nuclear plant in Maine. The story is the fall out from the plant disaster ... its effects on Emily as well as the landscape. It's one of those "what happened after the event" stories which I find interesting ... I imagine the author reading of a newsworthy crisis and begins to wonder what happens to those lives caught in the vicinity of the tragedy.